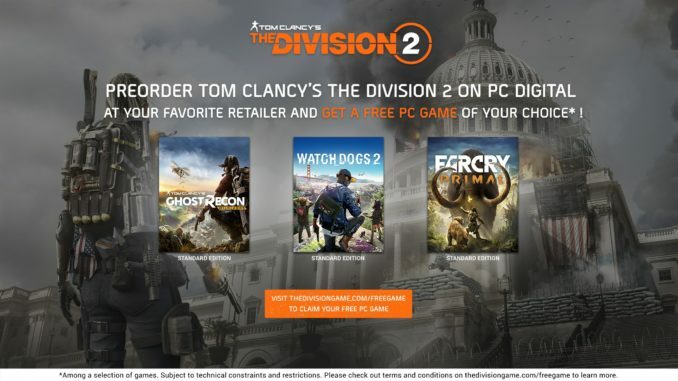 Ubisoft is giving away a PC game for free when pre-ordering the PC [Digital] version of Tom Clancy’s The Division 2 at your favorite retailer until March 15th. Once you have pre-ordered the game and activated it with your Uplay account, you have time until March 30th at the latest to follow the instructions and conditions on thedivisiongame.com/freegame to claim your free copy of either Ghost Recon Wildlands, Watch Dogs 2 or Far Cry Primal. According to the website and in case you already own all of them, a “special gift” will be given away when the game comes out. Here’s an overview of the various versions and editions of The Division 2.